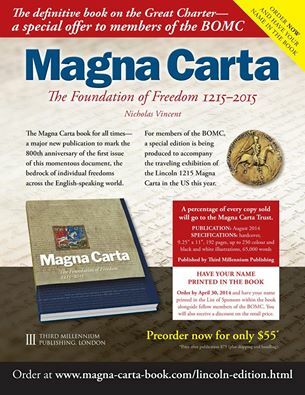 BOMC is pleased to announce the sponsorship of a major new Magna Carta book-a book for all times. Magna Carta-1215-2015-Foundation of Freedom, edited by the renown scholar Nicholas Vincent, will be published this year by Third Millennium of the UK. It is available to all interested in the MC and if you subscribe by 30 April 2014, your name can be listed at the back of the book on the BOMC page as a sponsor. Click on the Lincoln Edition to order. On the order page type BOMC in the organization blank. For further information contact the Charles Lucas, MD.